So, what is a manifesto and why do you want to create one of your own? A manifesto is a public declaration of policy and aims. It’s a mission statement, a proclamation, or an announcement of one’s values and commitments. 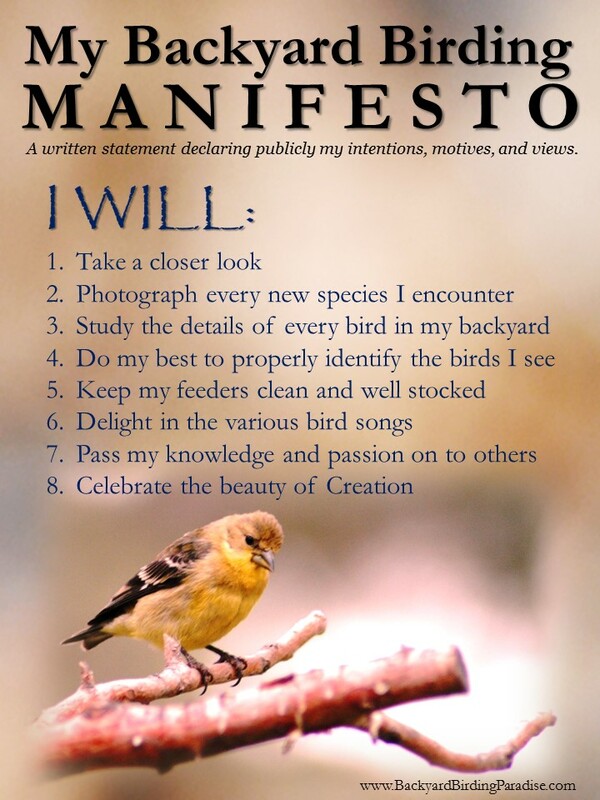 I decided to create a manifesto of my intentions with regard to our wildlife habitat and bird sanctuary. I want to keep myself accountable and reminded of my commitment – to our wildlife and birds. I want to be a good steward of our habitat and make sure our wild guests are comfortable, safe, and well fed. I figured a manifesto would be the perfect tool for that reminder, keeping me focused on what I value and serving as my north star when things get tough. Creating my manifesto was an interesting exercise. I researched different approaches and finally I just started writing down those things that were important to me in terms of the commitment I was willing to make. I had to keep it simple, though, otherwise the task seemed daunting. But it wasn’t too terrible. In fact, it was an insightful exercise. So, here’s my backyard birding manifesto. How would yours read?